Old Favorites - Sometimes you just want to learn a nice simple break to a song that people will recognize. You'll find that, and more, on this DVD. From You Are My Sunshine and Wildwood Flower, which almost everyone knows, to the Reno & Smiley bluegrass standard Love Come Home, you'll find many jam-friendly songs here. And the boogie-woogie break we teach for Rocky Road Blues can be used on other bluesy songs as well. Add some new classics to your repertoire with Old Favorites! Although you don't have to learn the tunes in the order they are presented here, we do recommend it. Tired of using a capo? Tired of all your breaks sounding the same? Tired of not being able to play in D or E or F? 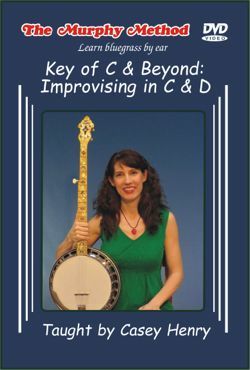 This DVD opens the door to playing in the keys of C, D, E, and F. First we show you how to do simple improvs in open C, no capo. Then step by step we explain how to add more complex licks to these breaks. We are not "giving you a fish. We're teaching you to fish." Using simple songs and simple licks we teach you how to create your own breaks in C. In a jam. On the fly. When you have no time to think. We also explain how to play these same breaks in D, E, and F.
An amazing step forward in teaching by Murphy Henry, the creator of the Murphy Method. 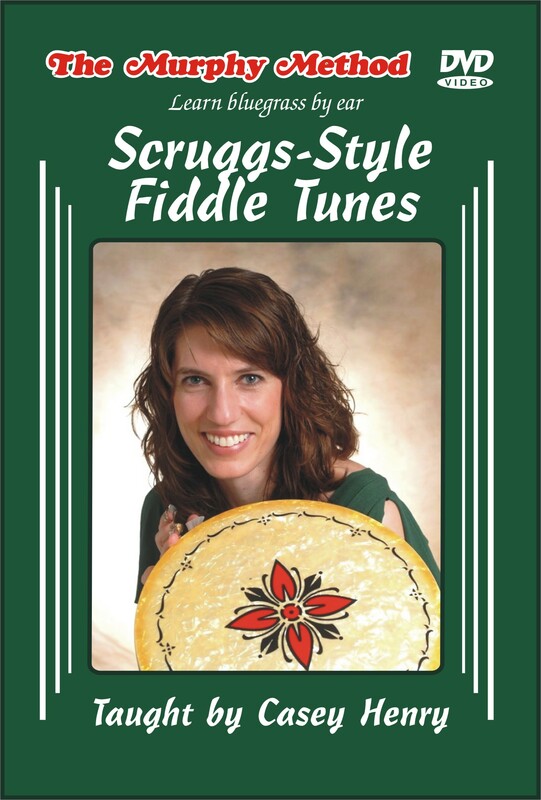 Scruggs-Style Fiddle Tunes - Some tunes lay out really easily on the banjo and some just don’t. These six popular fiddle and flatpicking tunes do NOT lay out particularly easily on the banjo. But over her years of teaching, Casey has developed these very playable, Scruggs-style arrangements, and her students have successfully learned them. 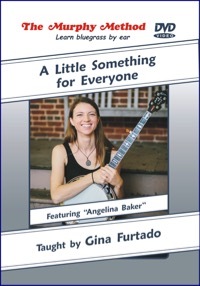 If you jam with fiddlers or guitar and mandolin pickers who play these tunes you need this DVD! These six songs are designed as stand-alone lessons—however, some are easier than others! Red-Haired Boy and Angelina Baker are very doable for the intermediate player. Whiskey Before Breakfast and Cherokee Shuffle are advanced-intermediate level, and Forked Deer and St. Anne’s Reel are solidly advanced.